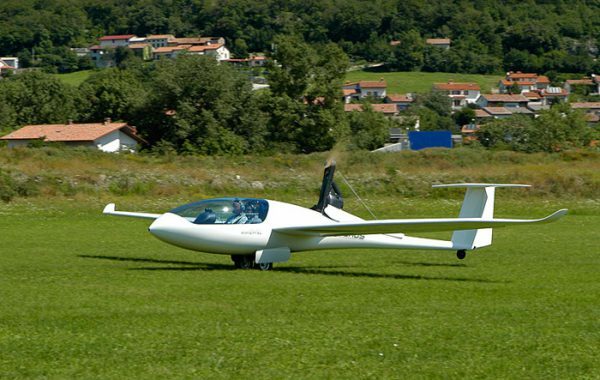 Pipistrel is proud to produce the Taurus LSA, the first ever high-performance two-seat self-launching glider with all advantages of the LSA category. The MTOW has been increased to 550 kg/1210 lbs which provides for an impressive payload of more than 250 kg/550 lbs! 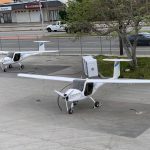 Taurus LSA is equipped with an impressive 50 HP retractable power pack, allowing for completely unassisted powerful takeoffs also on super-short runways and glider fields. Takeoff distance is less than 600ft even when fully loaded and the rate of climb settles at the 600 fpm mark. In the world of two-seat self-launching gliders, such take-off and climb performance are not seen every day! In the Taurus LSA you will reach 3000 ft AGL is less than 6 minutes and this is where the Intelligent Engine Control System takes over. The system is fully automated, making sure that the propeller has positioned itself correctly and retracts the engine for you while you concentrate on finding that perfect lift. Built-in safety even prevents inadvertent start-ups or retractions of the engine! 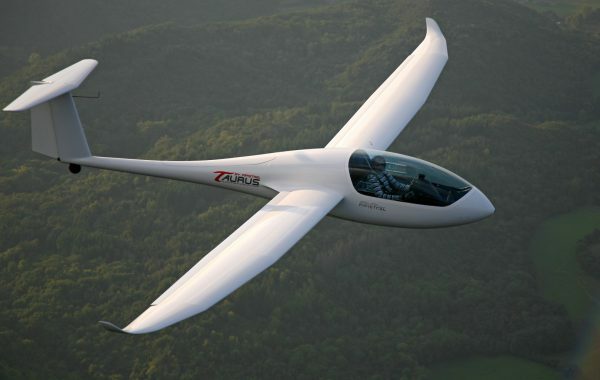 As a glider, Taurus LSA sports a glide ratio of 41:1 and features 5-stage flaperons to improve the performance at both low- and high speeds. One thing you notice immediately on the Taurus LSA is the luxurious, incredibly spacious and comfortable side-by-side cockpit, specially optimized for tall pilots. 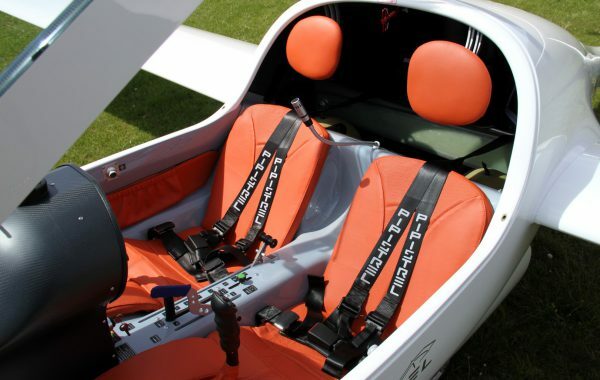 Side-by-side seating arrangement makes communication between the pilots perfect, unlike conventional tandem two-seaters. Full dual controls are reachable to both pilots and the pedals, seats, headrest and ventilation can be adjusted to suit your body and needs in just seconds, also during flight. For convenient storage and luggage hauling there are side pockets for each pilot and a roomy baggage compartment behind the seat with space for an oxygen system as well. The baggage compartment is accessible during flight, a major breakthrough in gliding! 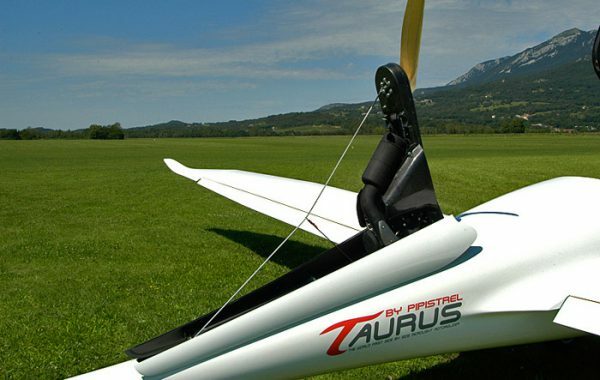 With Taurus LSA, gliding really becomes independent. Gone is the necessity for any assistance during assembly, flying (including take-off) and disassembly- you really can go gliding whenever wish and wherever you wish! Taurus LSA features two parallel, robust main landing gear to achieve ground stability on simple taxing through a steerable tail wheel. – at the price of about 50% of what you would pay for another self-launching two-seat glide, Taurus LSA will be a success story in the world of gliding! 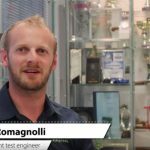 Safety is Pipistrel’s primary concern. Taurus LSA features the Safety Cockpit Concept. The entire cabin area is encased with energy absorbing structures made from Kevlar fiber, an amazing material which maintains the integrity of the cabin and makes it safe also in case of stronger impacts. Together with our special Safety Cockpit Concept the Taurus can also be equipped with the ballistic parachute rescue system, which saves the complete aircraft together with the crew in case of severe emergencies. Ready for the future? Have you ever wandered what is it like to fly all electric? Virtually silent and vibration free? With no emissions whatsoever and for the fraction of the usual cost? Inquire about the Taurus Electro, a fully electric-powered version of Taurus LSA with same performance numbers. Both pilots have individual control columns and rudder pedals with hydraulic wheel brakes levers. The landing gear operation lever, flaps, airbrakes and trim levers are for joint use of both pilots and are therefore located in the middle, between both seats. The instrument column not only fits all instruments, but also the throttle push-lever, choke lever, tow-rope disconnection handle, ventilation handle and engine retraction system interface. All handles and levers ensure sensitive, yet reliable aircraft systems handling. For added comfort pilots enjoy adjustable headrests, adjustable rudder pedals, separate vent window for each pilot and a central ventilation system for efficient de-fogging of glass surfaces. The canopy is a molded single transparent plexi piece with no support columns. 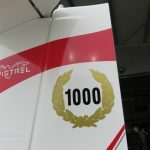 The entrance to the cockpit is therefore simple and unobstructed as is the visibility out of the cockpit in all flight stages. 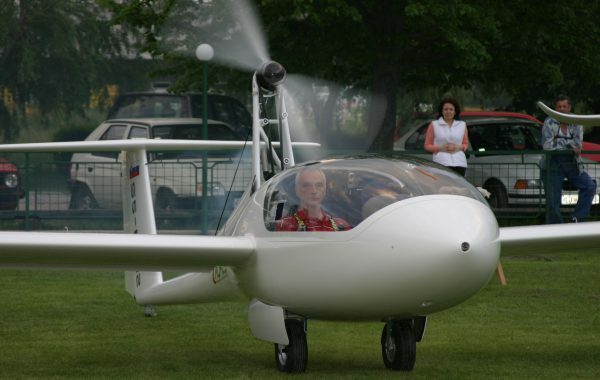 The version of Taurus with an auxiliary retractable engine is fitted with a ROTAX 503 twin carburetted engine which drives a Pipistrel propeller. This power configuration provides the aircraft with short-field takeoff and very decent climb performance. The system for extending and retracting the engine and propeller is fully automated. The pilots take advantage of a dedicated interface on the instrument column and all he/she has to do is flick the switch to ‘Engine IN’ or ‘Engine OUT’ position – everything else is done completely automatically. When retracting, the propeller is first positioned vertically before the engine gets retracted and the covers close. To restart the engine on the ground or in-flight, the pilot selects the ‘engine OUT’ option and the engine extends & starts-up all by itself after the covers have been opened. The entire engine retraction system is incredibly light and reliable. All switches and sensors used to monitor the operations are electromagnetic-induction type and as such are not sensitive to vibration, mechanical damage and/or dirt. The Taurus has a taildragger undercarriage. The two main, retractable wheels are equipped with separate hydraulic brake systems for easy ground handling. The undercarriage retracting system is fully mechanical but only needs very light forces on the cockpit lever during operation. The tail wheel is not retractable but fully steerable, which makes taxiing a walk in the park. The Taurus comes equipped with a rocket charged parachute rescue system which is fired out of the fuselage in case of extreme emergency. The parachute opens instantly and the aircraft slowly descends to the ground without the pilots leaving their seats. Furthermore, the aircraft is not additionally damaged by use of rescue system; the cabin and pilots remain completely intact. The airbrakes, flaps, trim and their drives are all mechanical and identical to the ones used in the Sinus. One of the unique features of the Taurus is the mass trim system. There are two fluid reservoirs in the aircraft, one in the nose and one in the tail section. Since both pilots sit in front of the CofG, the CofG range can move quite considerably. In case only one pilot is on board, the trim fluid is pumped into the front reservoir. 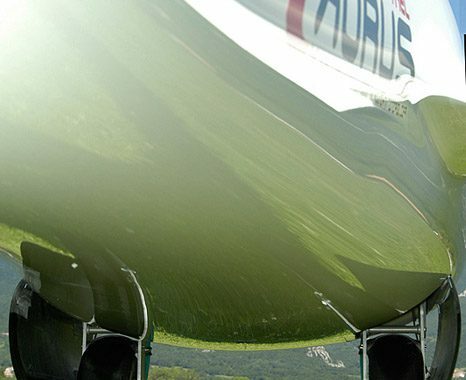 Should there be 2 persons on board, the trim fluid is pumped into the tail section. By using the mass trim system the aircraft becomes safe and insensitive to big differences in pilot weights. Additionally the unpleasant carrying and insertion of metal weights is eliminated. 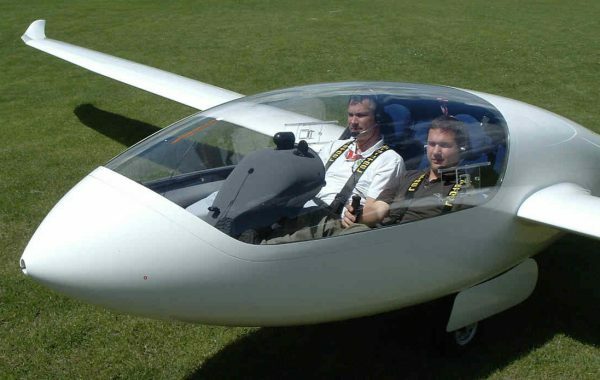 The Taurus is a high performance two-seater glider, with a glide ratio of 41:1 and a fully retractable engine. The Taurus sets new standards in efficiency for light aircraft. The main idea of the Taurus was completely different from the Sinus and the design criteria for the team was to ….. 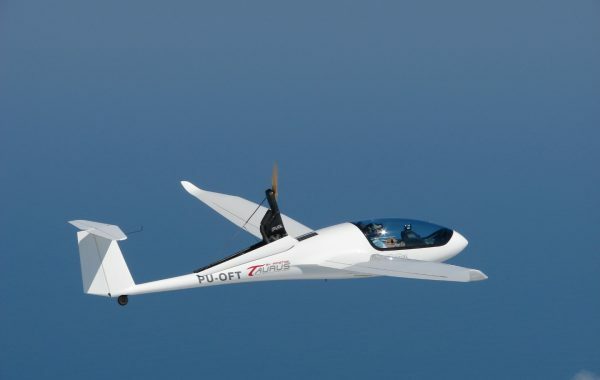 In order to reduce development costs, Pipistrel decided to fit the Taurus with an already existing wing, which has proved to be excellent on Sinus and the single-seat ultralight Apis glider. The fuselage of the Taurus has, however, been developed and shaped from scratch. Using special lifting body shape concepts, it features enough room for an auxiliary, yet fully retractable engine and an incredibly spacious cockpit. It was not easy to decide how to shape the pilot’s workspace, but in the end the fact that the World’s population is growing in all measures prevailed. The pilots in the Taurus are seated side-by-side for comfort and ease of communication. Furthermore, this kind of seat placement saves some weight, since some of the control systems do not have to be made separately. the Taurus is also intended for training, therefore all control levers are well within reach of both pilots.